How Many Solar Panels Do I Need to Power My 3,000 Square Foot Home? The answer is not so simple. In fact, I can’t even give you a rule of thumb. Some industries can tell people a reasonable range for sizing equipment, and often building codes dictate sizing of appliances. For example, an A/C company might tell you that on average you need one ton of air conditioning for every 600 square feet of living area for a Southwest Florida home. A plumber might tell you that you need a minimum 50 gallon water heater for a 3 bedroom, 2 bath home. There is no such approximation with solar energy. The energy used by a home, and more specifically a homeowner, can vary tremendously (note: homes don’t use energy – people do). My 3,000 square foot home uses about 2,000 kilowatt-hours (kWh) of electricity each month. I’ve been at a customer’s 2,500 square foot home that uses 3,500 kWh of energy! That would be a range of 0.67 – 1.4 kWh per square foot per month – hardly a useful range to use as a rule of thumb. Energy use is complicated. People have very different habits, standards of living, and luxuries. Pool homes consume more energy generally. Old air conditioners and poor insulation cause poor efficiency for cooling. Some people run incandescent lights in their yard 12 hours a day. And many times, habits are the cause. What we need to know is how much energy you use. Fortunately, that’s easy to find out. Both utilities in Southwest Florida have online account history that shows you energy use by month. We can help you figure out how much energy you are using and how many solar panels you need to power your house! This article tells nothing. The question was simple. the answer resembled a political debate. 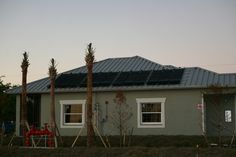 How many panels and batteries are required to run a home in Florida? details…2100 sf, brand new construction, 3 br, 1 den, new air conditioner, 1 fridge, 1 stove, 1 microwave, 3 tvs, 1 computer, 20 outlets, no fridge in the garage, and oh yeay, an inground pool/hot tub. Is there a kw ratio to follow, or do we buy 100 batteries and 500 panels to make this happen? I really want solar energy in my new home and all the bs online is just confusing. No wonder more people dont do it. HELP!!!! – What temperature setting will you set on your thermostat? – What is the R-Factor of your insulation? – What is your roof type and color? – What is the R-Value of your windows, where are they on the house, and what sun exposure do they have? – What size fridge, what efficiency level, and how often do you plan to open the door? – Do you cook at home, how often, and do you use your oven? – How long do you watch each of your TVs? Do you unplug them when not watching? Will you have a cable box or DVR, and do they remain plugged in all the time? – How long do you use your computer? What type? Desktop? Laptop? – What’s plugged into the outlets? How long? – What size pool pump do you have? How long do you run it? – Do you heat your hot tub? How hot? How long What time of year? Obviously, I don’t really want you to answer these questions, and this isn’t easy to figure out, but there is hope. If you jump to the last paragraph of the post, I mentioned that your utility company provides tools to tell us how much energy you use. That’s great if your goal is to get to net-zero utility bills. However, the energy you use in your home is irrelevant to the energy you produce! The better question is, “How much solar energy can I produce at my house?” That’s a simple question to answer. based on the available roof space, we can determine how much energy production potential your home has, and how much you can offset your electricity bill in terms of dollars. The point is, we need more information about your goals to help you understand your solar options. It’s really not as hard as I made it sound, perhaps. If your goal is to reduce your electricity bill to zero, we just need to know what your current usage is to tell you if it is possible and practical. If you just want to make a dent in your bill, we can tell you what it takes… Simple! If you want a simple formula or a rule of thumb for Southwest Florida, assume that a 1 kilowatt (kW) solar energy system will produce approximately 1,400 kilowatt-hours per year. If you use 14,000 kWh per year, you need a 10kW system to get to net-zero. You don’t even tell how many panels you use on your own home. What a stupid article. Despite your not-so-nice comment, I will give you the answer for which you are looking… none. I don’t have solar panels on my current home yet, but I plan to install them before year-end. My average electric usage based on the last 12 months is 1,800 kilowatt-hours. To offset that completely, I would need around a 12.5kW solar electric system. I actually plan to install a 10.0kW system for a few reasons, including available incentives, available roof space, and future efficiency upgrades that I plan to make. Initially this system will cover about 80% of my bill. The point of the article was to demonstrate that you can’t size a solar electric system based on the square footage of a house, the number of bedrooms and bathrooms, or any other factor that is not the actual measured energy use. It is also highly dependent on the people in the house. Houses don’t use energy. People use energy. Energy use is a choice. In addition, it depends highly on the orientation and pitch of the solar panels, and the equipment selection. There is no simple rule of thumb for system sizing. That’s why solar professionals exist, and why you shouldn’t rely solely on what you read online. Any number of solar companies will be willing to provide you with a free analysis based on your actual energy use and home. I’m sorry you found the article stupid. I will try to do better in the future. How much did the solar panels cost you? That’s not an easy question to answer, because I did the work myself and was able to get wholesale prices and generous incentives. Something like this today in 2016 would cost about $35,000 – $40,000 installed by a professional solar dealer before a 30% Federal Income Tax Credit, making the net cost around $25,000 – $28,000. In stark contrast to the previous comments I’d like to thank you for your informative article! It really opened my eyes to how I need to look at developing my solar energy system. I have a 1200 sf home with a 10kw solar system with 39 panel’s. We use 1350 kw per year acreage. We have produced an average of 1300 kw of solar per year over the last 4 years leaving about 50 kw we must buy from the power company. We have mostly all energy efficient appliances except a stove and water heater that are 20 plus years old. When we replace these when they die we should have about a 100 to 200 kw excess. Four years of solar output and I’m very pleased with forecasted output and actual output as we are over forecast. Also zero maintenance so far. 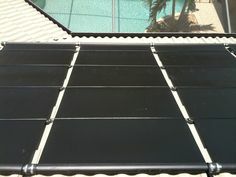 Solar World panels and a 10kw SMA converter. I’m on a solar feed in tariff and can bank in the summer, love it. My system is finally up and running, and so far it is meeting my expectations. I’m projecting to cover 80% of my electric bill. Jason is giving political answers. Which like politicians, means he dosn’t know, and makes one question his honesty in even knowing anything about or even using solar. If a home uses 3500kwh a month you should be able to give a rule of thumb on ; monosilicon, polysilcon, or film square footage needed. Wow, Kevin! That’s quite a charge. Ill humor you. This assumes you are using the most popular technology, which is about 15% efficient. In other words, that’s not going to fit on a 3,000 sq ft house. Your missing the point. The question was about determining solar capacity based on a home’s square footage. Of course we can give you an answer if you have your actual consumption figures! P.S. I’m no politician, and I don’t like politics. Very nice reply. So my house is in the shape of an L. It’s one story south Texas. It’s approximately 2900 sq ft. So I want to use solar power as well. I to want to cover 80% of my electric bill. All I need is a price though. 😉 thanks Jason. Dave, tell me your actual consumption in kilowatt-hours over the last 12 months and I can give you a reasonable answer. The size of the house is not indicative of the solar energy needed. I find your explanation quite good. It still amazes me how some people just does not get it. My Daughter will turn every light on in her house and her KWH’s of usage are outrageous. Now on the other hand I am very conservative when it comes to KWH’s. My house is about 1000 SQ.FT. bigger then hers but my KWH’s are about 1/3 of hers. Her house is an older house and that will make a difference also. Mine on the other hand was built with all 2×6 outer walls and has a SHI_ pot of insulation (R factor). So I with that, if most people would just set and THINK just a little bit I am sure in most cases they would see the SIZE in sq. ft. has very little to do with it. I’m sorry Jason, but I have to agree with Scott regarding the ambiguity of your response, although I don’t agree with his method of conveying his message. The question is simple if put in another way. Let’s presume for the sake of argument, just to be safe, you suggest a 12,000 Watt non solar generator (nat gas, diesel, gasoline) should be more than enough to give a 3000sqft house full replacement capacity during say an outage. Thus.. How many panels are needed to create the same 12000 watt capacity? yes, we know that the panels will not be able to provide full capacity round the clock, and we know that there are variances in demand based on structure, etc… but simply, how many panels are required to provide 12000 watts? And second, how much would a fully integrated 12000 watt system, including battery back up, cost? Solar Panels – provides energy (power over time) that can be used instantaneously, stored in batteries, or wasted. Battery – stores energy that can be used to produce power on demand. Inverter – produces power for instantaneous usage from the energy stored in batteries and produced concurrently by solar panels. Generator = Inverter — A generator that puts out 12,000W of rated power can be compared to an inverter that is rated at 12,000W. There are some differences, most importantly that generators use energy even when not delivering power and inverters typically have a far greater sure capacity than generators, which can stall from momentary overloads. Inverters also put out cleaner, stable power (some generators now include inverters to stabilize output). Fuel Tank = Battery — A generator has a fuel tank that contains usable energy that can be converted to power by burning it. A battery contains usable energy that is converted to power with an Inverter. The rating of the fuel tank and battery dictate the capacity of the storage device. A good diesel generator with a 5 gallon fuel tank can store the equivalent of about 60 kilowatt-hours of energy at full load – you can use 12 kilowatts of power for 5 hours. Realistically, generators rarely run at full load (or their maximum efficiency point), because loads are variable. Therefore, the actual energy value of a tank of fuel is some factor less. Trip to the Gas Station = Solar Panels — Solar panels replenish “the tank” (the battery) over time as they are exposed to solar radiation. The speed at which they fill the tank depends on how many solar panels you have, the rating of each panel, and how much sunlight they see. 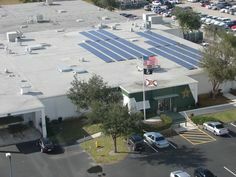 A 1,000W solar panel produces about 5,000kWh on an average day in Southwest Florida. A 12,000W solar panel produces about 60,000kWh on an average day. To refill a fuel tank, you need to physically deliver fuel to it. The rating of solar panels is not analogous to the rating of generators. The relationship is much more complex. I have simplified the examples above. In reality, there are many more factors to consider. You need to consider the size of the solar array based on your ENERGY use, the battery based on your ENERGY use and the POWER rating of the solar panels, and the inverter based on the maximum POWER required in your situation, which would be 12,000W (analogous to the generator rating). Imagine this – a generator salesman comes to your home, tells you that a 12,000W generator will work great for you, but installs a 1 gallon fuel tank and you live 50 miles to the closest gas station and you don’t have a car to go get gas. Obviously nobody would do that, but the point is you need to consider more than just the power rating of the system. Energy storage capacity and the ability to refuel are critical components of any backup system. There is no simple answer to this complex problem. An experienced dealer (generator or solar) is your link to a satisfactory backup solution. Good stuff man and your time is much appreciated. This might sound repetitive, but what I’m missing in understanding (my fault) is breaking it down to a time component… in my case, per day. My peak, is 100kwh per day, according to my electric bill. How many 250W panels would I need to cover 100kwh usage per day? I think this is all the information you need? If not, let me know what else. … Once again thanks for your time on this, and don’t pay any attention to the folks are so freakin negative. bk: You don’t really need to focus on the peak – you really need to look at the average – over an annual period, not a day, week, or month – because the amount of energy produced changes as the seasons change. And, the rating of the panels doesn’t work the way you describe. 250W panels will rarely generate 250W, and there will be losses in the wiring and conversion to AC energy. That is why we have models to determine the expected output of a system on a monthly and annual basis. Really all that matters in a netmetering situation is the annual energy use number. Here is the good news – if you know your annual usage (in total), it is relatively easy to calculate the PV system size required to offset your energy use as a rule of thumb. In Southwest Florida, you can expect in an average year about 1,400kWh per installed kw of rated PV power for an optimally located and oriented system. For example, if your electric bills total 16,800kwh per year, you will need a system size of 16,800 / 1,400 = 12kW to offset your entire usage. This is a rough estimate, or course, and the exact components and weather in any given year will impact the actual energy output. You will still be billed the base customer charge and perhaps a small amount of tax. This is a simplified answer, because your system output will deteriorate a small amount each year, so you might want to oversize your system a little, and there are other factors involved – factors a qualified solar advisor can help you understand. Orientation and shading are big factors that might require a larger system to meet your needs. And, of course you do not have to offset your entire bill. You can install a system that just covers a portion of your usage. Many people start out with a smaller system to get accustomed with living with solar – not that it takes any adjusting – everything is seamless! Note: None of the above in this response applies to off-grid systems. There are additional losses involved, and factors like battery recovery time come into play. I think the biggest signal misconception many struggle with is this. PV solar power is a “low density generator” with this in mind and if you want to power your home/ business or make your carbon foot print as close to zero or less dependent on a power company you will have to reduces your energy consumption prior to installing PV solar power before it can be worth any reasonable ROI. Building science 101, reduce the usage/ foot print/ demand on energy and fix up that low code minimum performance home and make it a high performance home less dependent on the power company and environment… PV solar is a great idea however its just not that simple for most peoples needs and wants or its all in want you choose to believe. Example: Home A 1,500′ living: Home using 80-100 kWh per day needs a lot of help (energy intervention I call it) this would be the last place I would consider PV solar. Home B 1,500′ living: Home using 20-40 kWh per day need less help and is very close to becoming a zero or less energy efficient home. Great place for PV solar a large % of it can be sold back to the utility during peak time if that is something you want to do. Think about it do you want the truck that gets 10 miles to the gallon or the Truck that gets 25 miles to the gallon and can go just as fast and pull the same weight/ trailer. Almost forgot PV solar does not work at night unless you have another energy source. With this in mind you have to adjust some of your living habits like laundry, warm showers, cooking, etc. My best advice reduce the home or business energy needs first prior to installing PV solar and never ever finance a PV solar project all your savings just went out the window!!! All good points, Scot, especially about conservation, which is typically cheaper than production. However, making blanket statements about what homes are good candidates is dangerous. Sometimes upgrading the energy efficiency of a home can be very expensive – even more that the cost of just producing energy despite the wasteful design of the home. It take a good evaluation to make informed decisions. Regarding the solar not working at night, that problem is eliminated with a grid-interactive system. You can overproduce during the day and under-produce at night and have a seamless experience with no change in lifestyle. I read with interest you article. I thank you greatly for your time and still providing essential information in the face of some trying posts and when some don’t understand the essential work that must be done before you can size a solar system. I also want to convert to solar. I am a Computer Consultant and have a large data center I run out of my home to get residential electrical rates. I have set it up with an inverter (ContextSW4024 Schneider Electric) and eventually a back up generator. I bought the Inverter to actually implement a large UPS system for my Data Center. I run off the grid right now but my electric bills are very high. $700-800 per month. I run about 30 Data Center computers with a huge VMware Cloud system. I put in a separate meter to make uncle Sam happy and it looks like on average I am pulling about 70Kwh per month on the Data Center alone . I would like to put in a solar array to at least take care of the data center but also power some of the house if feasible. If I wanted to cover my power to the data center alone. About how many panels would you suggest and who provides the best bang for the buck as a mfg of those panels? Bang for the buck should also consider that I will have these probably 25 years so I would like a good quality panel as well. Again thank you for your help! I am sorry I mis-posted. That was a calculation per day. not per month. So my monthly figure should be * 30 or 2100Kwh per month. Assuming you are in Southwest Florida and you can place panels with ideal tilt and orientation, you will need around 18kW of rated solar power to cover 2,100kWh per month on average. Right now the best bang for the buck is always changing based on what deals are out there, but we have been very happy with Canadian Solar and Hyundai. There are lots of options, and any of the major brands should be fine. If you’re in our area, please get in touch at (239) 491-8010.
you are welcome to email me but I am in in your area frequently and I can send you pictures of the data center and show you how unique it is. Its fairly impressive I think. You really do a very nice and detailed job of explaining these complexities. Keep up the good work. I get asked this question (how much solar do I need for my xxxx sqft house) all the time…glad to know I am not the only solar sales guy who can’t give an easy answer! I am using 1900 Kwh per month in March. The average use per day is 65 Kwh. I have 3Kwh worth of panels on my roof in South Florida facing south. This month I only sent 31Kwh in 30 days back to the grid. I have no batteries or back up so my power goes directly to the inverter. Am I losing power and not getting credit for it? or am I using the solar power directly in the house and only the excess is making it to the grid? seems like 31Kwh a month back in the grid is very little help when I am consuming 1900Kwh. First, a correction. Your system is probably rated at 3kW, not 3 kWh. kW is a unit of power whereas kWh is a unit of energy (electricity, or power over time). While your system is rated in kW, your electric bill is based on kWh. It sounds like you are using most of the energy at the time it is produced. For a home that consumes 1,900 kWh of energy, a 3kW system is pretty small. If you have steady power using appliances like a pool pump for example, you will not see much energy pushed back to the grid because it is consumed concurrently with production. A roof mounted 3kW system in March with ideal orientation in Miami can be expected to produce approximately 404 kWh (per NREL’s PVWATTS average year). Does your PV system have a monitoring system? I recommend microinverter based systems for the robust monitoring capabilities. I just had my system activated. It’s much fun to watch that meter go backwards. I went with 32 LG315s, enphase , and solasolaredge. 10kw system. I have only had it on for 3 days so I don’t know much about my savings yet but I’m looking forward to it. That’s fantastic, Jerry. You can’t have both SolarEdge and Enphase, so I’m curious about what you are running. What neck of the woods are you in?